When a person’s heart or breathing stops and the cause is reversible, immediate cardiopulmonary resuscitation (CPR) offers a chance of life. However, when a person is dying—for example, from organ failure, frailty, or advanced cancer—and his or her heart stops as a final part of a dying process, CPR will not prevent death and may do harm. “Do not attempt CPR” (DNACPR) decisions were first documented in the 1970s, to try to protect people from receiving CPR that they did not want, that would not work, or would not give them overall benefit. This approach of making CPR decisions separately from decisions about other treatments has been challenging for clinicians and patients and has caused problems.1 2 3 4 Despite national guidance in the UK (see “Further educational resources” box), misunderstandings, poor communication, and inconsistent DNACPR documentation persist.4 Exploring and achieving a shared understanding among patient, family, and healthcare team of realistic and individualised care preferences may sometimes be done badly or not even attempted. This article draws on an evidence synthesis,4 two systematic reviews,5 6 and consensus discussions in a group of stakeholders covering a broad range of care settings and specialties. These stakeholders included nurses, patient representatives, ambulance clinicians, and doctors, who together have developed the ReSPECT process in the UK.7 The principles described are applicable more generally to discussions about advance planning for future emergencies. Who may benefit from having a plan for a possible future emergency? Consider offering this to people with complex health needs, life limiting conditions, or illnesses that predispose to sudden deterioration or cardiorespiratory arrest (box 2). Ask yourself whether a person is likely to have a deterioration for which recommendations agreed in advance could help immediate decision making. Think about the situations in which others may have to make immediate decisions about care and treatment for that person in their individual circumstances. These will vary substantially between individuals and might include a sudden acute illness (such as heart attack, stroke, sepsis), deterioration in a long term condition (such as advanced kidney failure, heart failure, lung disease, frailty), or sudden cardiac or respiratory arrest. Other people may ask to make a plan because they want to record their preferences in case of an unforeseen future emergency. If people have the capacity for relevant decisions, consult them about current and anticipatory treatment decisions—in the UK this is a legal requirement. If they lack capacity, consult those close to them, where practicable and appropriate (see box 3). If family or other carers cannot be consulted immediately, make and document any necessary urgent decisions, ideally agreed with other team members, along with a clear plan to consult as soon as possible. In the UK, the exception to this is if someone has been appointed as legal proxy with powers to make decisions about life sustaining treatment: that person’s decisions must be viewed as binding, as long as they clearly serve the patient's best interests. What is the difference between an emergency care plan and an advance or anticipatory care plan? Emergency care plans provide concise, relevant, rapidly accessible clinical recommendations for use in an emergency. Advance or anticipatory care plans are more detailed, often completed by the patient, and may focus specifically on end-of-life care. The two plans are complementary; they may be developed together, or completion of one may prompt consideration of the other. If your patient has or is making an advance care plan, suggest also developing an emergency plan. If you are developing an emergency plan during an acute illness, consider whether a more detailed advance or anticipatory care plan is needed or wanted at that time, or may be needed or wanted later. Qualitative studies suggest that conversations are best initiated when people are relatively well with time to discuss treatment options and consider their preferences before a crisis occurs.8 9 Ideally, discussion will involve a health professional who knows the person well. For many, the community healthcare team will be best-placed to initiate a conversation about an emergency care plan. In some instances, further conversations or liaison with other professionals such as hospital specialists or palliative care teams may be needed. Give people ample opportunity for discussion. Explain to the patient that the aim is to produce recommendations which can guide immediate decision making in a future emergency in which the person does not have the ability or capacity to make or express choices. A succinct emergency care plan can provide rapidly accessible information about a person’s condition, preferences, and agreed recommendations for care. This helps professionals faced with an emergency to make immediate decisions and deliver appropriate, desired care to a person who has lost capacity to make or express choices. Avoid jargon. Don’t assume that patients or families understand why making a plan is needed. Families have told us that they did not understand why clinicians were so keen to record a decision about CPR for patients who were dying or critically ill. Which realistic treatment and care options may help or not help them. The points below may help clinicians to progress a conversation. Start by discussing the person’s understanding of his or her condition and circumstances, and correcting any misunderstandings or unrealistic expectations. 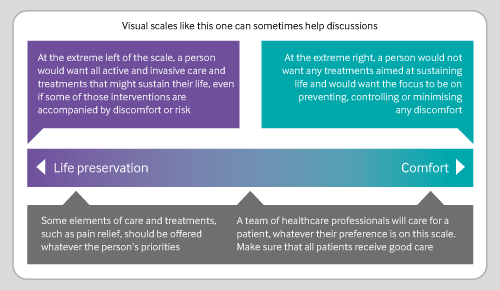 Many will want a balance between these—the type of scale shown in the infographic can sometimes facilitate this part of the conversation. Explore what is important to them for the future. For example, this may be independent mobility, communicating with friends and family, the ability to read or ability to listen to music, being cared for at home. Discuss any realistic treatments that could help achieve their aims and decide together what recommendations to record. These might refer both to treatments that they would like to be considered for and those that they would not want. If there is a realistic possibility that CPR would restart their heart and breathing, explain its chances of restoring a length and quality of life that they would want, and record the resulting agreed recommendation. If there is no realistic likelihood that CPR will work, because the person dying from an advanced and irreversible condition,15 explain this sensitively unless to do so would cause harm. If a person with a life limiting condition wants to die at home, document this and, after explaining the need for it, record a recommendation not to attempt CPR. If relevant, discuss and record circumstances (if any) in which the person would want to be taken to hospital. Having identified goals of care and the patient’s preferences, decide together what clinical recommendations to record. Ensure that you record recommendations in clear, unambiguous language that will be understood easily by those needing to read them in an emergency—such as an ambulance clinician, nurse, or out-of-hours doctor who may not have met the person before. Box 4: When should documentation be reviewed? Frequency of review should be planned according to each person’s individual situation (frequent review for an acute illness but not usually for an advanced, irreversible, and terminal illness). A fixed review or expiry interval risks encouraging insufficiently frequent review for some people, and inadvertent expiry (leading to disregard of the recommendations) for some whose recommendations needed no review. ReSPECT is a new emergency care plan developed in the UK to support conversations and record recommendations arising from discussion between clinician and patient or those close to the patient. Box 5 lists three hypothetical scenarios for recording of emergency care plans, and the data supplements show the completed ReSPECT forms. Such a summary plan should remain with the patient. Further information about the ReSPECT process can be accessed at www.respectprocess.org.uk. After further explanation of what would be involved, she decides that she would be willing to go to ICU for treatment but would not want “invasive” ventilation. She and the doctor agree that if she became worse and it became apparent that she was not going to recover, or that she would end up in a very dependent state, they could stop trying to cure her infection and concentrate on treatments to make sure that she was comfortable. The doctor explains also that, if she got worse and died, her heart and breathing would stop as part of the natural process of dying, and trying to start them again wouldn’t prevent her death. She is quick to say that she “certainly wouldn’t want to be resuscitated” if this happened. The ReSPECT form is completed (see supplementary ReSPECT form 1 at www.bmj.com/content/bmj/356/bmj.j876/related#datasupp). In the event, she improves with antibiotic treatment and chest physiotherapy and is discharged home after 5 days. On discharge, the conversations about ReSPECT are revisited, and her preferences are unchanged. The agreed clinical recommendations are therefore communicated to her GP and she is offered the ReSPECT form to keep with her, so that it will be available immediately if she has a further sudden health problem. The GP asks what she means: would she want to go back if she had another severe infection and might die from it? “No”, she says. She would want to have treatment at home and, whilst she was willing to be given antibiotics at home for another infection, she would want the main focus of her treatment to be on ensuring her comfort, not trying to prolong her life for perhaps a few weeks or a few days. ReSPECT is discussed with her, and a form completed (see ReSPECT form 2 at www.bmj.com/content/bmj/356/bmj.j876/related#datasupp). Some drugs, including an opiate, are left in the house as a “just in case” pack. Two weeks later she develops breathlessness and pain, and becomes confused. Her family call 999; an ambulance first-responder arrives, asks if she has a ReSPECT form and is shown it. As there was a clear plan for her to be treated at home, he does not call for an ambulance, and helps the family to contact her palliative care nurse, so that she can receive her “just in case” treatment without delay, together with ongoing care and support for her and her family. A 48-year-old man with cerebral palsy and epilepsy has recurrent admissions for aspiration pneumonia, sometimes requiring admission to the intensive care unit (ICU); sometimes these admissions have been brief; sometimes it has been difficult to wean him off the ventilator. His GP has a ReSPECT conversation with him about what is important to him; it is clear that he enjoys life and, although he has found the long recovery periods following ICU admissions arduous, he would do it again. A ReSPECT form is completed, recording an agreed recommendation for full, active treatment in the event of further pneumonia A ReSPECT form is completed, recording an agreed recommendation for full, active treatment in the event of further pneumonia (see ReSPECT form 3 at www.bmj.com/content/bmj/356/bmj.j876/related#datasupp); details are communicated to the local hospital. When he has a prolonged seizure a few months later, the paramedics follow the recommendations on his ReSPECT form and take him to the emergency department, telephoning his emergency contacts from the ambulance. The emergency physicians read the ReSPECT form, make sure that he has full supportive care during his post-ictal phase, and assess and treat him for recurrent aspiration. This requires admission to the ICU for a brief period of ventilation, after which he recovers, is discharged and continues to enjoy life. The same principles can be used for people of all ages (see box 6). Avoiding discrimination—Advanced age or a disability on their own are not appropriate reasons for recommending withholding potentially life sustaining treatment.17 Discrimination may occur also if a person is subjected to CPR with no realistic chance of benefit, simply because they are younger or because of an assumption that they would want this. Adopting a patient’s perspective—When discussing life-sustaining treatments and their chance of success, define success from the person’s perspective, not in terms of what you (or those close to the patient) might consider an acceptable duration of survival or quality of life. Help people to express realistic preferences for their future care and treatment in a future emergency and to understand that these cannot be used to demand specific treatments. Uncertainty—Many clinical situations involve some uncertainty. Where this exists, be open and honest. Patients and those close to them need support to cope with uncertainty. If you do not feel competent to do this, seek help from a colleague who does. Explore training opportunities to improve your skills and confidence for future occasions. Resolving disagreement—Provide further explanation (involving experienced colleagues if necessary) to try to achieve shared understanding of the basis for proposed recommendation(s) and agree a shared decision. If disagreement persists, offer and arrange a second opinion before recording any recommendations. Record only agreed recommendations on an emergency care plan. Document details of all discussions in the person’s health record, including details of any disagreement. Where there is persistent disagreement over critical elements of care or treatment, legal advice may be needed. Are you familiar with your organisation’s policy on decisions about CPR? What training for important conversations about CPR and other treatment decisions does your organisation provide to its staff? NHS Scotland. Realistic medicine. Chief medical officer’s annual report 2014-15. www.gov.scot/Resource/0049/00492520.pdf. General Medical Council, National Council for Palliative Care. Talking about end of life care: communication. https://vimeo.com/159875499. One of the authors, MW, is one of four patient/public representatives on the consensus group that developed the ReSPECT process and the recommendations expressed in this article. She was involved in planning the article, review of drafts, and approval of the manuscript. The development of ReSPECT included both a public consultation and discussion in patient focus groups. Another member of the public with relevant personal experience, who preferred to remain anonymous, emphasised the importance of specific training for clinicians, reviewed the manuscript, and made further suggestions. Contributors: Peter-Marc Fortune, associate clinical head of Royal Manchester Children's Hospital and president of the Paediatric Intensive Care Society, reviewed the manuscript and drafted the content of box 5. Peter Davies, general practitioner, Halifax, and Care Quality Commission regional advisor in general practice, North of England provided some initial suggestions for the manuscript content. Competing interests: All authors and contributors have been involved in the RESPECT project. This is a collaborative project, facilitated by the Resuscitation Council (UK). As part of the project we have produced new documentation to support emergency care planning for patients in the UK. As members of the Resuscitation Council (UK), DP and ZF have conducted promotion of and education in high quality resuscitation and received travel and accommodation expenses for these activities. ZF has also received research grants to evaluate emergency care plans. JAS has worked for Marie Curie, NHS Scotland, and Scottish Government on DNACPR policy and advance care plans, and received travel and accommodation expenses for these activities. Patient consent not required (patients hypothetical). Fritz Z, Fuld J. Ethical issues surrounding do not attempt resuscitation orders: decisions, discussions and deleterious effects. J Med Ethics2010;36:593-7. doi:10.1136/jme.2010.035725 pmid:20675736. National Confidential Enquiry into Patient Outcome and Death (NCEPOD). Time to Intervene. NCEPOD. London 2012. www.ncepod.org.uk/reports.html. Beed M, de Beer T, Brindley PG. Two decades of British newspaper coverage regarding do not attempt cardiopulmonary resuscitation decisions: Lessons for clinicians. Resuscitation2015;86:31-7. doi:10.1016/j.resuscitation.2014.10.002 pmid:25449344. Perkins GD, Griffiths F, Slowther A-M, et al. Do-not-attempt-cardiopulmonary-resuscitation decisions: an evidence synthesis. Health Serv Deliv Res 2016;4. Field RA, Fritz Z, Baker A, Grove A, Perkins GD. Systematic review of interventions to improve appropriate use and outcomes associated with do-not-attempt-cardiopulmonary-resuscitation decisions. Resuscitation2014;85:1418-31. doi:10.1016/j.resuscitation.2014.08.024 pmid:25195071. Mockford C, Fritz Z, George R, et al. Do not attempt cardiopulmonary resuscitation (DNACPR) orders: a systematic review of the barriers and facilitators of decision-making and implementation. Resuscitation2015;88:99-113. doi:10.1016/j.resuscitation.2014.11.016 pmid:25433293. Seymour J, Gott M, Bellamy G, Ahmedzai SH, Clark D. Planning for the end of life: the views of older people about advance care statements. Soc Sci Med2004;59:57-68. doi:10.1016/j.socscimed.2003.10.005 pmid:15087143. Mullick A, Martin J, Sallnow L. An introduction to advance care planning in practice. BMJ2013;347:f6064. doi:10.1136/bmj.f6064 pmid:24144870. Fritz Z, Malyon A, Frankau JM, et al. The Universal Form of Treatment Options (UFTO) as an alternative to Do Not Attempt Cardiopulmonary Resuscitation (DNACPR) orders: a mixed methods evaluation of the effects on clinical practice and patient care. PLoS One2013;8:e70977. doi:10.1371/journal.pone.0070977 pmid:24023718. Ebell MH, Jang W, Shen Y, Geocadin RG. Get With the Guidelines–Resuscitation Investigators. Development and validation of the Good Outcome Following Attempted Resuscitation (GO-FAR) score to predict neurologically intact survival after in-hospital cardiopulmonary resuscitation. JAMA Intern Med2013;173:1872-8. doi:10.1001/jamainternmed.2013.10037 pmid:24018585. Harris D, Willoughby H. Resuscitation on television: realistic or ridiculous? A quantitative observational analysis of the portrayal of cardiopulmonary resuscitation in television medical drama. Resuscitation2009;80:1275-9. doi:10.1016/j.resuscitation.2009.07.008 pmid:19699021. Musa I, Seymour J, Narayanasamy MJ, Wada T, Conroy S. A survey of older peoples’ attitudes towards advance care planning. Age Ageing2015;44:371-6. doi:10.1093/ageing/afv041 pmid:25917242. Caldwell G. Full cardiopulmonary resuscitation should not be used for ordinary dying. BMJ2015;351:h3769. doi:10.1136/bmj.h3769 pmid:26173441. Rosenfeld KE, Wenger NS, Kagawa-Singer M. End-of-life decision making: a qualitative study of elderly individuals. J Gen Intern Med2000;15:620-5. doi:10.1046/j.1525-1497.2000.06289.x pmid:11029675. Heslop P, Blair P, Fleming P, et al. The Confidential Inquiry into premature deaths of people with learning disabilities (CIPOLD). Norah Fry Research Centre. Bristol 2013. www.bristol.ac.uk/cipold/reports/.